I will withhold my own thoughts (and location of the bird) just to see what other people come up with. Thanks! Very short dark area between the greater secondary coverts and the pale secondary edging suggests one of the Western Flycatcher complex. That's a good point, but I don't think a small amount of dark on the secondary edging always rules out Yellow-bellied. For example, this picture https://macaulaylibrary.org/asset/101590971 (assuming it does represent a Yellow-bellied since it's on the Birds of NA site) shows a similar small amount of black on the secondaries. Where was this seen? That would help narrow down options. 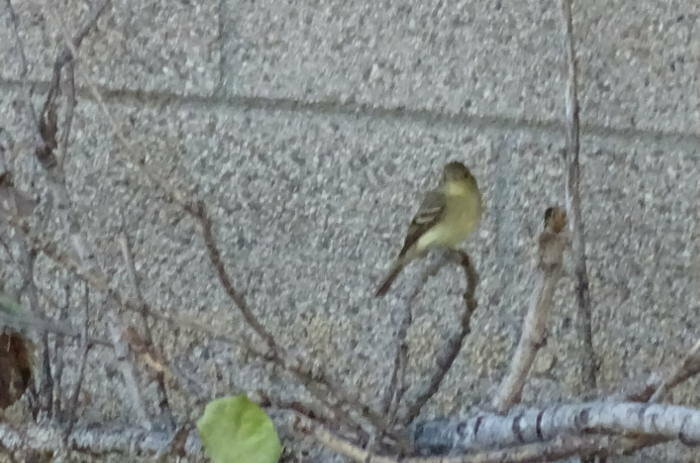 It was seen in California, so Yellow-bellied would be very rare. I have seen quite a few Pacific-slope Flycatchers, but this one 'felt' different and made me interested enough to take a lot of pictures, so maybe that is worth something. The field mark I was referring to was published just a few years ago, by a group in California that looked at a lot of specimens around the country. They found one "Yellow-bellied" in the Field Museum collection, found dead in Chicago a few years ago, that turned out to be a Western-type (most likely Pac-slope, I believe, based on DNA). That's a specimen lying in a museum drawer -- Empids often are that hard to ID! Actually, the authors are from New Mexico. At least, Baumann and Witt are; I don't know the other two. One interesting thing from the article I linked was the explanation of wing morphology to separate the Yellow-bellied & Western flycatchers. That said, I'm not entirely sure if I understand how to tell if the last wing tips shown in my photos above are p8-7, with a slight space, or if p8 is hidden 'stacked' under p7. It seems particularly hard to know as it sounds like p9 (and p10?) are shorter than the rest and entirely hidden, so it's not possible to "count backwards".